You may have guessed from the cat picture, above, that Tom and I are missing the General and feeling a bit pet deprived. You would be right. 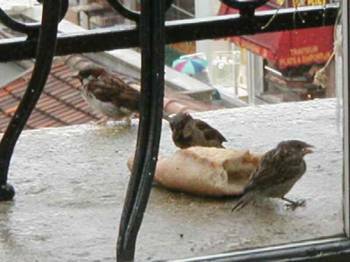 We have even succumbed to leaving stale baguettes on the balcony, and watching the sparrows munch on them in the rain. That's all for now. 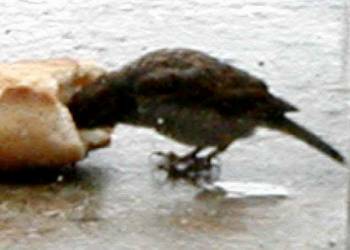 A bientot! Yesterday was an uneventful, rainy day, filled with housecleaning and routine shopping. But in the evening, the weather cleared and we went for a walk in the neighborhood. Here are a few pics from the 'hood that may reveal a bit more about ordinary life in Paris. The apartment building at left is one of our favorites. You'll notice that it is not entirely made of stone - the parts between the carved areas are brick. In fact, what appears to be carved stone may indeed be cement. This means that, in spite of its apparent elegance, it is not necessarily the most desirable type of building to live in. 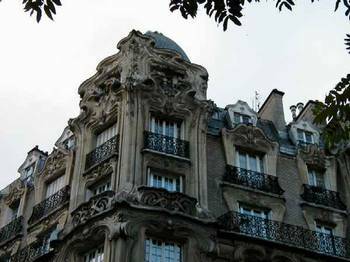 Most Parisians prefer buildings made entirely of stone. We'd be satisfied with this, however! The building is turn of the century, and it is located down at the end of our commercial street, rue du Commerce, behind our parish church, St. John the Baptist of Grenelle, at the corner of avenue Felix Faure in the fifteenth district. Another street that leads toward the parish church is rue de l'Église (could you have guessed?). 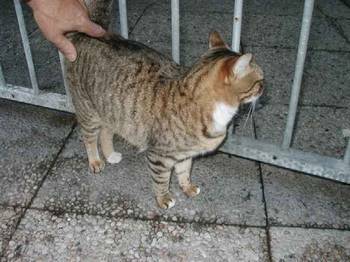 We met this fine cat there. Notice she has one white sock on one back foot. 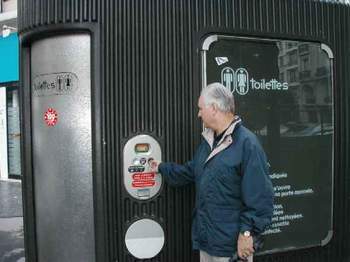 Have you wondered what one does when one just wanders the streets of Paris all day, and one comes upon the time when one desperately needs to find a restroom? Not to worry. "Toilettes," such as these, are located conveniently all over Paris. This one (below, left) is caddy-corner across the street from the lovely apartment building, above. Tom is demonstrating how to insert two francs. Then the door opens, you go in, close the door, use the clean little restroom, open the door, leave, it closes behind you, and then the Toilette cleans itself. When it is done cleaning, the sign on the door indicates that it is, once again, available ("libre"). Lovely parks exist throughout Paris, and especially in the fifteenth district, there are many, many small neighborhood parks. 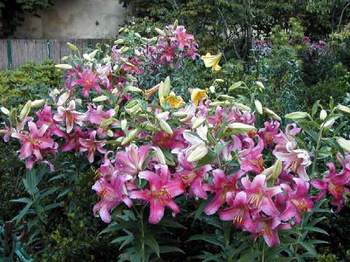 These lilies (below) are growing in Parc Violet, near where we live, which is named after Leonard Violet, the developer who created this area (called "Beaugrenelle") in the nineteenth century. Leonard used to live in a chalet facing this park. But in the 1820s, he ran into tough times and had to move into a small house on a street that bears his name. The chalet was converted into a fire station in 1860. The station faces the Place Violet. The Place and the park will be the location of the fifteenth district's "bal" (party) tonight, on the eve of Bastille day. Bals are held in each district, and are hosted by the district's firefighters. 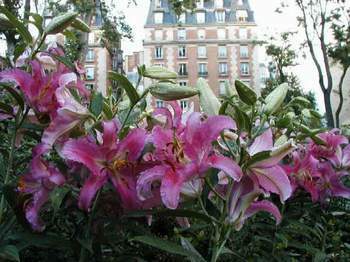 A typical fifteenth district apartment building is shown in the background, overlooking the park.